Offices, houses, airport, railway stations, roads all were flooded with rainwater. Data systems on the ground floors and basement areas were completely submerged under water, and this has made important data inaccessible which may lead to many businesses suffering, even more, losses. As an Industry leader, Stellar Data Recovery must help businesses and citizens of the city in these trying times. DO NOT Plugin – Do not attach any of your storage media to your computer or laptop which was submerged in water due to flood or felt in water/liquid. 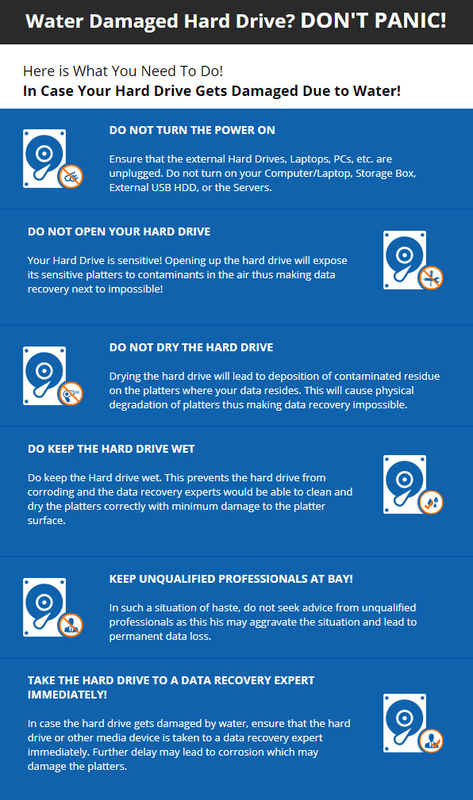 Do Not Dry the Hard Disk: The water regardless of the source contains particles that can damage the platter making the situation critical. People attempt to keep the devices under the sun or use a blow dryer which worsens the chances of data recovery. The dry out will lead to deposition of contaminated residue on the platters where your data resides. This will cause physical degradation of platters making it impossible to recover data from it. Keep the Hard Disk Wet – Yes, we suggest you keep your Hard disk wet. This stops the hard disk’s corrosion, and the data recovery expert would be able to clean and dry the platters correctly with minimum damage to platter surfaces. Timeliness: In the case of water damage to the hard disk, please make sure the hard disk or other media device is quickly taken to a data recovery expert. Do not delay, as the delay may lead to corrosion and may damage the platters. Opt for Qualified Professional Data Recovery Service Providers – Make sure that only a qualified professional hard drive data recovery engineer opens your hard drive in a certified Class 100 Clean Room. Do not hand over your media device with your important information to any amateur data recovery expert. As this may permanently damage the chances of data recovery, and can lead to permanent data loss. We at Stellar Data Recovery have successfully retrieved data from water damaged, wet or flood hard disks over the past twenty-three years. Most of all know the loss of data is stressful and whether it was caused by accidental spillage or natural disasters like storms or flooding, we aim to minimize your stress by getting your data back and ensure your data is safe and deliver it timely. Note – Stellar Launches ‘Free Data Recovery Consultation Service’ in the Flood-Hit States. Announces ‘monsoon special offer’ for data recovery requests from water damaged devices affected by floods in Gujarat & other north-eastern states of India. Here you can find your nearest branch. Thanks for providing these useful tips, I like reading this. Thanks for appreciating our blogs. Stay posted for more blogs updates from Stellar. Thanks for the information. I must say that the information provided answered many doubts of mine. Looking forward for another update from your side. Water will obviously damage the hard disk because it is very much sensitive in nature. Hard disk must not have any contact with water or else it will damage the whole system. Data can be recovered from water damaged hard drives. Useful reading !! I am from Aluva…Kerala….this area was affected with flood four months ago…as a result, hard disk of my pc got damaged due to flood water….we have given it to an expert to repair..but he is saying that it is fully damaged due to water…but we have some important data are to be recovered….can anybody help me. No hard drive is waterproof, which means water can destroy a hard drive and make data recovery difficult. We need your device with us to estimate how much data can be recovered. Submit your water damaged hard drive to your nearest Stellar data recovery centre for analysis. You can approach our Kochi branch (You can obtain free media pick up service too). Please let me know if you have tampered your hard drive?